Finnish packaging firm Huhtamaki has introduced a new single-use digitally enabled paper cup for retailers. The new Adtone cup from Huhtamaki Foodservice Europe-Asia-Oceania features a heat-activated label and a QR code which is programmed to link to customer's website. Huhtamaki said that the cup’s new digitalized connection feature makes it a perfect media for smart device centered promotional campaigns. 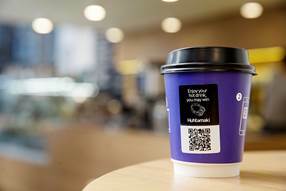 Controlled with special digital data management software, the unique and dynamic QR codes will turn the coffee cup into truly smart packaging, the company noted. The cup’s label features thermosensitive properties which hides the code until usage, thus safeguarding the promotional content for the customer until purchase. When customer pours a hot drink into the Adtone cup, the heat activates the thermochromic printing on the label. This reveals the unique QR code, which upon scanning with a mobile device, the customer will have access to promotional website and the associated digital content. The QR code’s smart code management software is designed to ensure single use of the promotion code by dynamically changing the digital content after use. The Adtone cup is intended to deliver the message effectively to the customers while enhancing their experience with fun and relevant digital content. Earlier this month, Huhtamaki announced its plan to establish a paper cup manufacturing unit in Ukraine, to grow its foodservice business in Eastern Europe. Image: The Huhtamaki’s new Adtone single-use paper cup. Photo: courtesy of Huhtamaki Group.